Perfect Pairs Blackjack card game variation possesses a gameplay similar to Vegas Strip game. Also this variant of standard blackjack presents a side bet called "Perfect Pairs" which adds more outstanding moments to the game. Perfect Pairs game is performed with 6 decks. The dealer distributes two face-up cards for a player and two cards for himself (1 face-up and 1 hidden). A Perfect Pair bet is allowed only for player initial 2-card hand and isn't affected by the dealer hand. If the initial hand is formed with a pair then the house will pay the player an additional wager (the rates of which are depended on particular type of pair possessed). The same rules are peculiar to casino online blackjack as well. Mixed Pairs - pay 5:1 - a pair of the card with a red suit and the card with a black suit (e.g. the King of Diamond and the King of Clubs). The side bet may not be the same wage as the initial one. Push - initial wager back. The dealer hits at any 16 or less (soft and hard) and also hits at soft 17. The dealer stands at any 17 (both soft and hard) and usually stands on soft 18 or more. In line with the blackjack rules the notion insurance means your personal defender against the dealer blackjack. 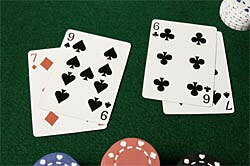 An Ace as a dealer hole card allows you to buy insurance with ½ of you initial bet. If the dealer blackjack combination appears then you will be paid the insurance with rate 2:1 and thus loose nothing. The insurance side bet will be lost if the dealer hole Ace won't transform into the blackjack combination.